Only 16% of Students “Traditional”? Not exactly. Though the fact is rarely noted, the traditional four-year college whose students are eighteen to twenty-two years old is rapidly becoming a thing of the past. Only 16 percent of all students2 currently fall into this category; the majority of students are now over twenty-two. So this adds an important piece — unlike Taylor’s quote, the 16 percent here refers to students in residence halls, which changes the meaning of the statistic completely. He cites the 2002 NCES report on The Condition of Education, and doesn’t give a specific page number, but rather, just cites the entire chapter on Nontraditional Students to back up his claim. Which would be good, I suppose, but nothing in that chapter mentions 16 percent of anything, or deals in any quantitative way with what proportion of students do not live on campus. What we see here are two trends (and remember this data encompasses the roughly 50% of students that are going to community college). 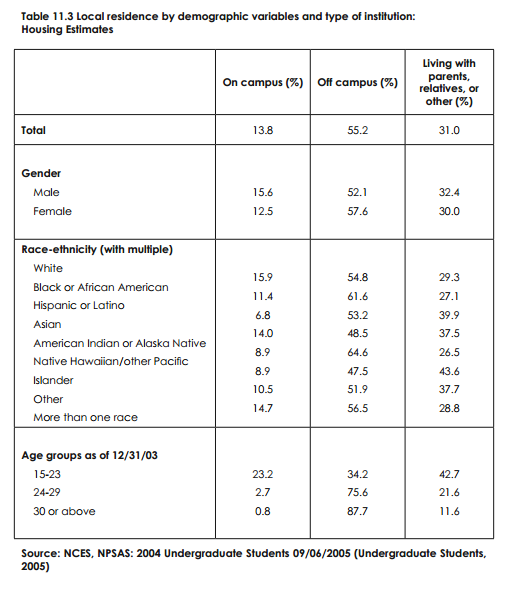 Younger students live at home more than on campus, and older students live off-campus independently more than on campus. This desire, of course, fades a bit over time. 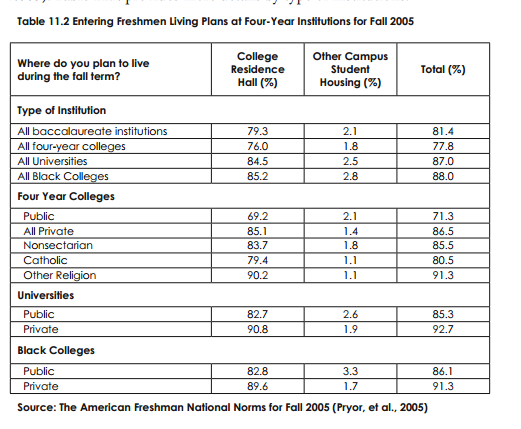 But it’s worth noting that the student that is counted as a senior as a “non-traditional student” for living off campus likely came in as a freshman very excited about an on-campus residence. If that’s the case, are we really looking at non-traditional students here — or perhaps just seeing a common pattern of students outgrowing the residence halls as they move through college? 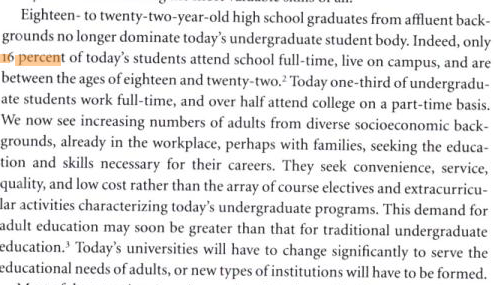 In any case, I think rumors of the death of the traditional student are a bit exaggerated. Certainly there’s a bit more nuance to the story than some would have you believe. I think the residential experience is ripe for reimagining — but we should start by admitting that it is still very much in demand, at least in the early years of traditional four year programs.